Assuming the world in the One Piece universe is round, then there is not really a beginning or an end of the Grand Line. The Straw Hats started out from the first half and are now sailing across the second half. Wouldn't it have been quicker to set sail in the opposite direction from where they started? No, there is a reason why they can't. Basically the New World is beyond the Red Line, but you cannot "walk" on it, or cross it. It's a huge continent, very tall that you cannot go through. You can't cross the Calm Belt either, unless you have some form of locomotion such as the Navy or Boa Hancock. 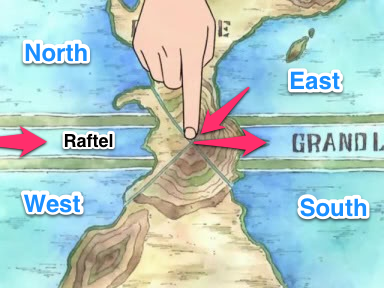 So the only way is to start from one of the Four Seas, then to go the Reverse Mountain and follow the Grand Line until you reach Raftel, which supposedly is where One Piece is located. Luffy's dream is to be the Pirate King. By definition in One Piece itself, the Pirate King is someone who most freely wanders in the Grand Line. Surely, finding One Piece is a necessity to become the Pirate King, but is not an enough condition. Luffy loves adventure by nature. He doesn't want to find One Piece so easily. If he wanted so, he could ask Rayleigh its location in Sabaody Archipelago arc. When Usopp asked it, he shout with a great voice and made Usopp stop asking it. And he said, if he were to learn its location, or even learns if it existed or not, he would quit being a pirate at that moment. Luffy simply wants to follow steps of the former Pirate King Gol D. Roger. He want to experience a good adventure. He wants to fight strong opponents. He always chooses the hardest path. If finding One Piece was his only goal, he could have of course spent his time learning cliff climbing skills instead of wasting his time in the sea. Then he could finally climb that huge wall of Red Line and search for Raftel there. One more thing to note is that the Location of Raftel is unknown. Even Shirohige didn't know it. Remember that, in a flash-back during the war in Marine Headquarters, Gol D. Roger asks Shirohine if he wants him to tell the location of Raftel. In addition to Alenanno's answer, it should be pointed out that the location of the One Piece isn't what is important, but the journey is what is important. If there were such an item as the One Piece located at Raftel, the Marines would have been able to get it already. 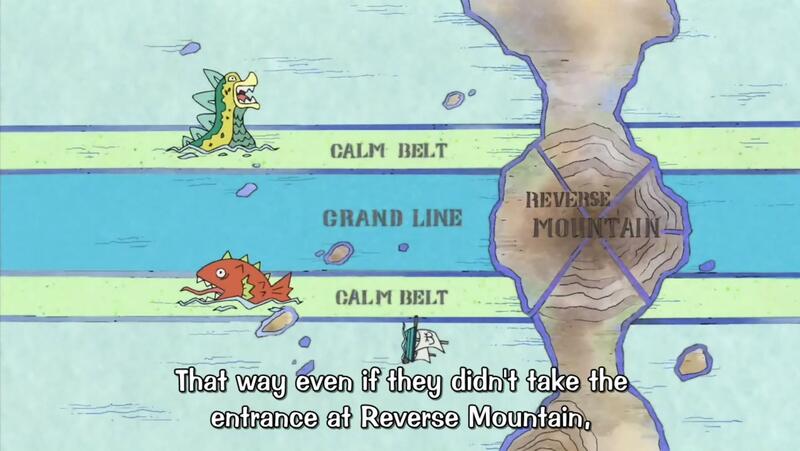 In episode 315, it was pointed out by Coby that the Marines' ships can cross the Calm Belt, and coming from North or West Blue, they would be able to just go to Raftel without doing the complete journey around the world. There are also lots of other ways for the World Government or the Marines to reach Raftel (e.g. Kizaru could use his mirrors, Kuzan could build an ice stairs, Fujitora could literally fly over there, ...). So if it were as simple as going to Raftel to get the One Piece, the World Government would have done so already, displaying whatever treasure it would be and trying to end this Great Age of Pirates. I think that the One Piece, being at the end of the Grand Line, simply refers to the fact that to get to the "One Piece", the legendary treasure talked about by the last Pirate King, you will need to travel to the "end" of the seas. In this case, that means traveling through the most remote/dangerous places so that only the worthy can get to it. Well, if Luffy chose the the easy way, he'd die, because much stronger opponents are trying to get One Piece. Plus, Gold Roger said to go get One Piece, so he must have left a guardian or something. It wouldn't be that easy to become pirate king. The One Piece is indeed at the end of the grand line but even Big Mom has had trouble finding it. The reason for this is that one cannot find Raftel without being able to read the Poneglyphs, specifically the four red Road Poneglyphs. Each of these leads to an island and the midpoint between those four islands is the location of Raftel. One Road Poneglyph is held by Big Mom, one by Kaido, one is on the moving island of Zao, and one is missing. Thus you can see that someone would have just as much trouble finding One Piece if they crossed the Calm Belt or the Red Line as they would doing things the adventurous way. In Epiode 378 of One Piece, what is the first song that Brook played? How did people even know that the One Piece was in the Grand Line?